Although she is remembered mainly for her novels, George Eliot also published two volumes of poetry in the course of her illustrious literary career. The Spanish Gypsy explores the conflicts that arise in a woman's life when she must choose between great duty and the prospect of a happy marriage. The book was widely reviewed and received mixed, though mostly laudatory, critical assessment. The reviewer for the Spectator found it "much the greatest poem on any wide scope...which has ever proceeded from a woman." After the Spanish Gypsy, Eliot never again attempted a book-length poem, but she did continue to write shorter narrative poems and some lyrics. 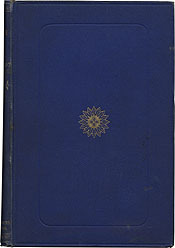 This rare presentation copy of The Spanish Gypsy was inscribed by Eliot to Emmanuel Deutsch, a Talmudic scholar who instructed her in Hebrew and influenced some of the ideas which later developed into her novel Daniel Deronda. The volume contains over 100 of Eliots substantial corrections and revisions in ink. George Eliot. The Spanish Gypsy; a Poem. London & Edinburgh: W. Blackwood, 1868.